"I could see the finish line. I could see the trophy at the finish line waiting on me. I thought, 'Just drive.' That's all I thought." - Texas A&M anchor Justin Oliver on finishing 2nd by .22 to give Texas A&M a sweep of the NCAA titles on Saturday in a thrilling NCAA meet. If Oliver had been passed, it would have been a four-way tie for first. 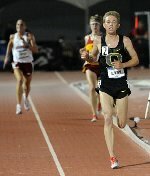 Galen Rupp's perfect season was not enough to give Oregon the coveted triple crown. Which NCAA win was most impressive? Fernandez Goes Wire-To-Wire In 1,500, Wheating Gets First NCAA Title, Gall Repeats, FSU Goes Sub-3:00 The men's team battle came down to the 4 x 400. 4 teams had a shot at the title and we ended up .22 from a 4-way tie for first. But in the end, Texas A&M finished 2nd in the 4 x 400 to win by 2 points over Oregon, Florida, and Florida State, who all tied for 2nd. We recap all the distance action, including German Fernandez's gun-to-tape 1,500m win as a true frosh, Andrew Wheating's narrow 800m win for his first NCAA title, and much more. Plus photos and video of the last lap of Fernandez's 1,500 and the men's 4 x 400. What a meet. Rupp's heroics were not quite enough to bring Oregon the triple crown. Plus Jenny Barringer with a meet record in the steeple, and the men's steeple final and the women's 5k final. Read all about it, photos, and video. Formatting fixed. Updated: 5k Interviews and quotes added to recap. *Eugene Register-Guard Recap Chris Winter: "I'm a little devastated right now, I lost two points for the team in those last five meters. I didn't know those guys were there, and that was my fault."